Enumukkala Sampath has completed his intermediate from Krishna Veni Junior College at Narasarao Peta in Guntur district of Andhra Pradesh. He lost his father when he was young; and is being brought up by his mother. As a single parent, his mother could only afford to send him to school and after that it became difficult for her to meet the educational expenses. Though Sampath was keen to study but compelled to drop out from the college. He was searching for an opportunity to support his mother. During those days, the team of mobilizers came to his mother and shared about the free skill training provided by Don Bosco Tech. Sampath came to the centre with his mother to know more about the program and its entitlements. The trainers described them the deliverables of the program and also said, “Don Bosco Tech will assist Sampath to find a placement after successfully completion of the training.” After counseling, he decided to enroll in the BPO course which is approved by the Sector Skill Council. During the training, Sampath was a good learner, punctual and very passionate about the domain. His ambition was to get a good job to support his Mother and sister. He studied hard to finish the course and also qualified in the final assessment with good marks. After the training, Don Bosco Tech provided an on-the-job training at Hinduja Global service where he performed really well in every aspect. Looking at the performance in the OJT, the employer absorbed him on the payroll with a monthly remuneration of Rs 7000/- per month. Now he is very happy with the job as BPO Trainer and supporting his mother financially. Now his mother is very much tankful to Don Bosco Tech for providing such opportunity to him which is certainly bring them on track. 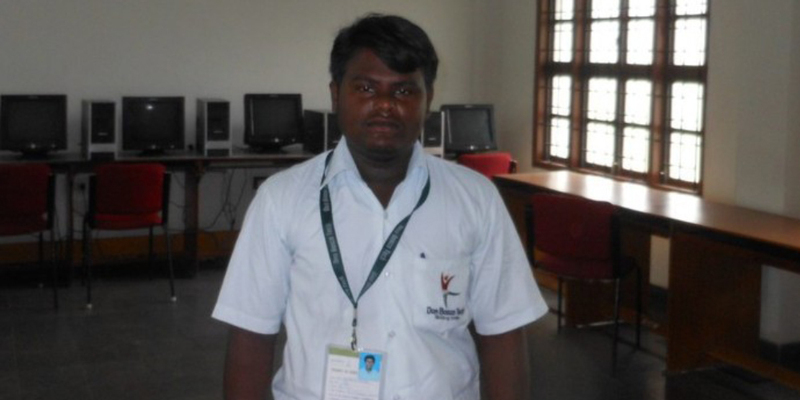 Don Bosco Tech made an impact in the life of Sampath by imparting skills and an opportunity.